Transnational corporations are a powerful force for binding national economies together. Through complex corporate strategies and intricate network structures, transnational corporations engage in international production characterized by a sophisticated intra-firm division of labour for each corporate function. As a result, they create an integrated international production system which places about one third of the world’s private sector productive assets under the governance of transnational corporations. 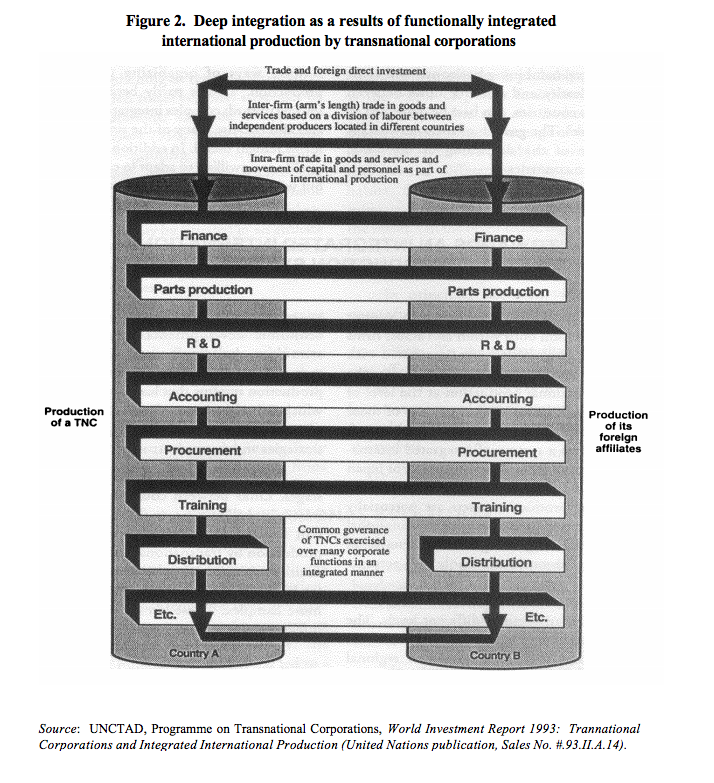 The World Investment Report 1993: Transnational Corporations and Integrated International Production, prepared by the United Nations Conference on Trade and Development (UNCTAD) Programme on Transnational Corporations (formerly the United Nations Centre on Transnational Corporations)–the third in an annual series of reports on transnational corporations and foreign direct investment–provides an analysis of the changing activities of transnational corporations and their impact on world-wide economic change. The major findings of the Report are summarized below. The universe of transnational corporations is large, diverse and expanding. 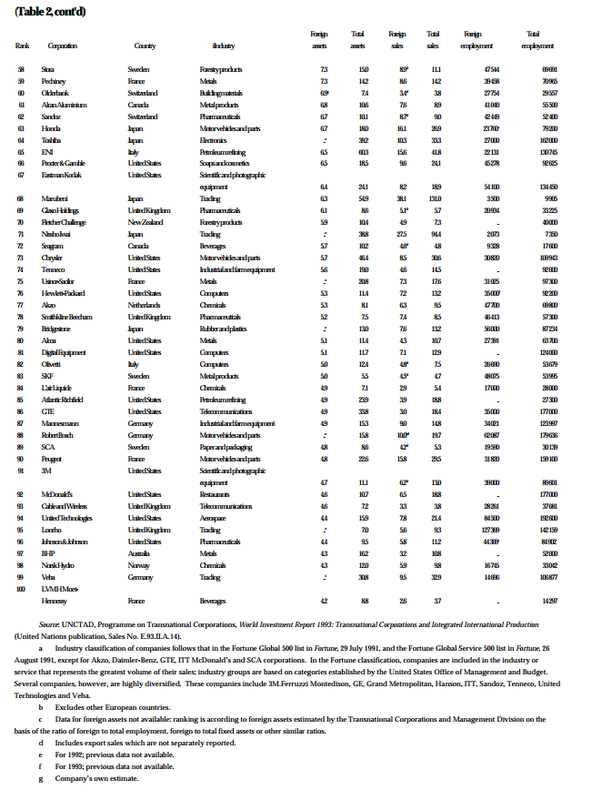 By the early 1990s, there were 37,000 transnational corporations in the world, with over 170,000 foreign affiliates (table 1). Of these, 24,000 transnational corporations were based in 14 major home developed economies, up from 7,000 in 1970. Even those figures understate the number of firms that operate as transnational corporations, both because of measurement difficulties, and because firms carry out their transnational activities and exert control over foreign productive assets through a variety of non-equity arrangements–subcontracting, franchising, licensing and the like–as well as through the formation of strategic alliances. These forms of international expansion occur with little or no foreign direct investment, and are therefore only partially captured by foreign-direct-investment data or by firm-level data defined by equity participation. More than 90 per cent of all transnational corporations are headquartered in the developed countries and less than 1 per cent are from Central and Eastern Europe. Those from developing countries account for approximately 8 per cent of all transnational corporations and 5 per cent of the global stock of foreign direct investment. The universe of transnational corporations is highly concentrated in terms of the share of foreign assets controlled by the largest firms. Roughly 1 per cent of parent transnational corporations own half of the foreign direct-investment stock or total affiliate assets. 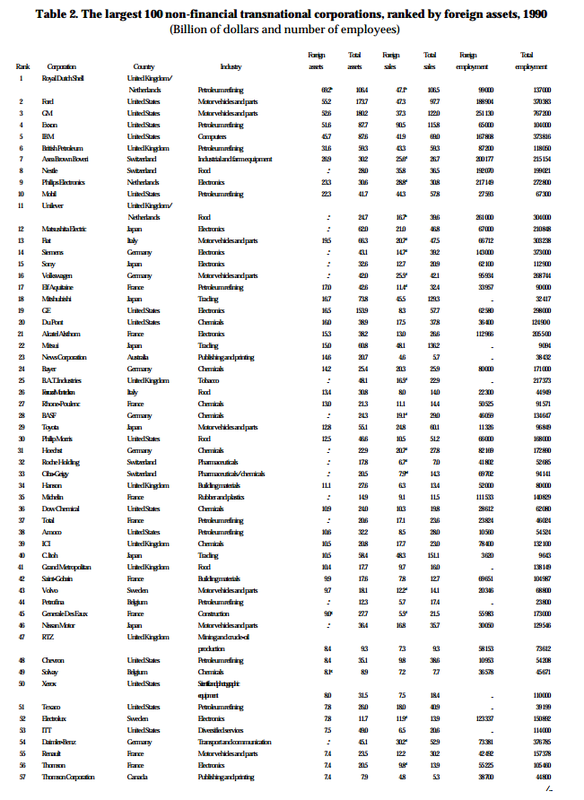 The largest 100 transnational corporations accounted for roughly $280 billion of the world stock of outward investment in 1990, 14 per cent of the total (table 2). The growing influence of transnational corporations can be seen in the increase in the stock of foreign direct investment and the growth in the number of transnational corporations and their foreign affiliates. 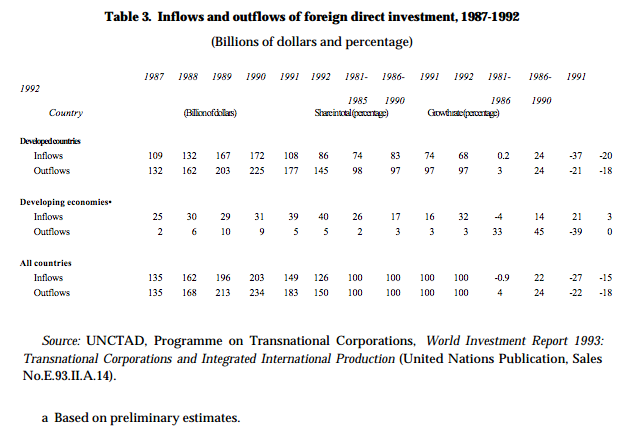 During the 1980s, and especially after 1982, annual foreign-direct-investment flows grew rapidly. By 1992, the global stock of foreign direct investment had reached approximately $2 trillion, which generated about $5.5 trillion in sales by foreign affiliates (compared to world exports of goods and non-factor services of $4 trillion). The pace of growth slowed during 1991 and 1992, but that is probably a temporary phenomenon, largely due to recession in the biggest economies. 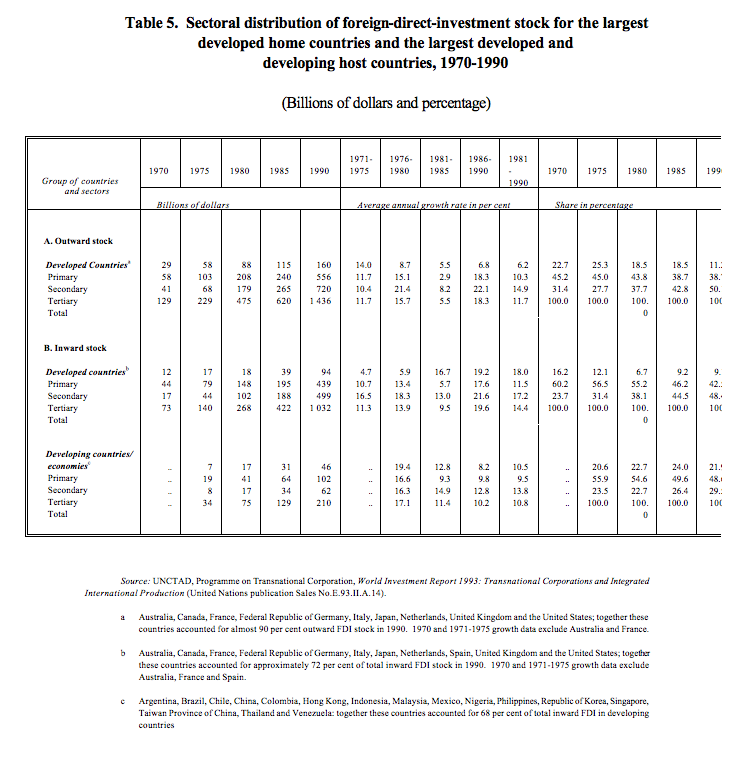 The growth of foreign direct investment in the 1980s was increasingly concentrated within the Triad regions, as described in the World Investment Report 1991: The Triad in Foreign Direct Investment (United Nations publication, Sales No. E.91.II.A. 12). In the early 1990s, however, investment flows to developed countries declined, while those to developing countries increased, especially in Asia and Latin America and the Caribbean, in response to rapid economic growth and fewer restrictions. The decline of investment inflows to developed countries can be attributed, in part, to slow growth and recession in the European Community, Japan and North America (table 3). The attractiveness of these economies as hosts was further reduced since domestic profitability also declined. In addition, recession has reduced the ability and willingness of transnational corporations from these economies to expand abroad. Japan in particular saw its investment outflows decline substantially as domestic financial weaknesses on top of declining profitability hampered the ability of Japanese transnational corporations to invest abroad. 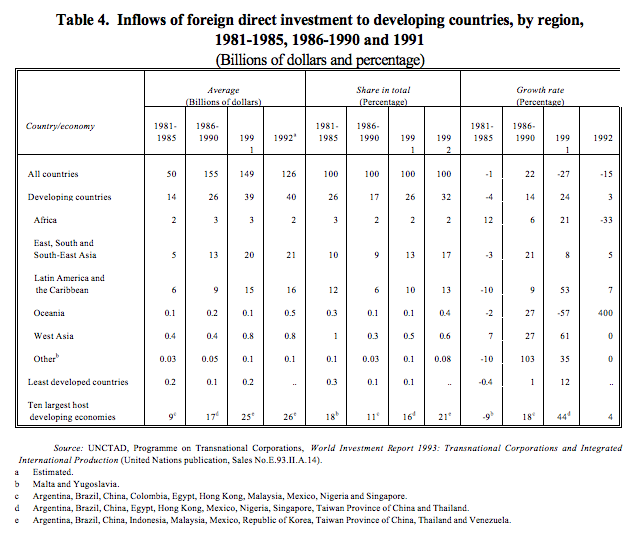 At the same time, the expansion of foreign direct investment to developing countries was the result of the resurgence of strong economic performance in a wide spectrum of developing countries in Asia and Latin America, their control of vital natural resources in Africa and their continuing efforts to liberalize and privatize (table 4). The growth of transnational corporation activities in Latin America and Asia has been further stimulated by progress towards a North American Free Trade Agreement and, in Asia, by various governmental actions to promote trade and foreign direct investment. The general trend towards liberalization and privatization has also been evident in Central and Eastern Europe where inflows continue to grow. The rapid increase in foreign direct investment throughout the world has been accompanied by a pronounced change in its sectoral composition, from the primary sector and resource-based manufacturing towards services and technology-intensive manufacturing (table 5). Although the growth in services foreign direct investment has followed advances in information technology, global expansion through foreign direct investment has been constrained by legislative obstacles. Consequently, the recent wave of liberalization has had a particularly marked effect on services foreign direct investment, which is likely to continue during the coming decade. Significant capital-intensive service industries (such as telecommunications and air transportation) have only recently opened up to foreign direct investment, providing new opportunities for transnational corporations. The stock of foreign direct investment in the primary sector is now dwarfed by that in other sectors. However, it still grew quite impressively during the 1980s. Indeed, in developed market economies, its inward stock grew faster than in any other sector and faster than the stock of primary sector inward foreign direct investment to developing countries. This unexpected development was brought about by the combined effect of intense merger activity, notably in petroleum, and the search for safer investment locations. However, as more developing countries introduce open and stable foreign-direct-investment regimes, there are signs that locational decisions in the primary sector are again emphasizing natural advantages. But the continuing uncertainty in some resource-rich economies in transition, particularly the Russian Federation and those in southern Africa, will affect future flows of foreign direct investment in this sector. The stock of foreign direct investment in the secondary sector has declined, relative to services, although in developing countries its stock was still considerably larger in 1990 than that in other sectors. The significant changes in manufacturing have been more qualitative in their nature. In particular, there has been a shift from labour-intensive manufacturing towards more capital-intensive industries, both across and within countries. During the 1980s, this was most pronounced in the inward stock of foreign direct investment in the newly industrializing economies. Furthermore, increasing technological demands in much of manufacturing are leading to new forms of corporate activity. Non and low-equity foreign direct investment have become established means to control assets abroad, and strategic alliances have expanded, particularly in those industries with short product cycles and high research-and-development costs. The decline in world-wide investment flows in 1991 and 1992 has marked the end of a period of constantly and rapidly rising flows that began in 1982 (figure 1). This slow-down raises the question of the extent to which the surge in investment flows in the 1980s was the result of short-term factors-the strong growth of the world economy and the boom in mergers-and-acquisitions activity or whether the influence of long-term factors is also changing the underlying trend. 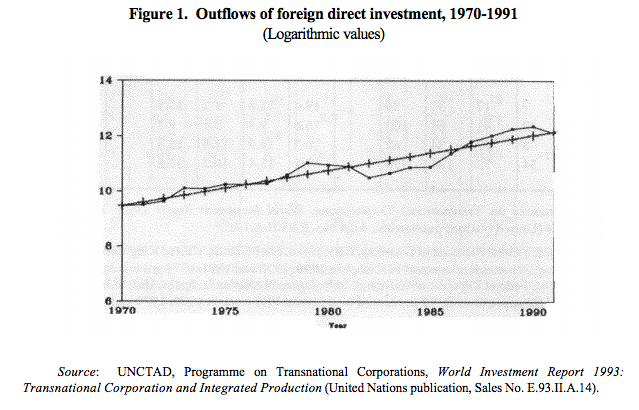 The pattern of foreign-direct-investment flows in the second half of the 1980s was the result of an inter-play between short and long-term factors. Similar to domestic investment, investment flows are strongly correlated with the growth of gross national product. The strong growth of the world economy in 1980s boosted the growth of foreign-direct-investment flows from the major home countries. The mergers-and-acquisitions boom also promoted the surge in foreign direct investment. The impact of those short-term factors was amplified by long-term factors–policy related developments and changes in the structure of the world economy as a result of the operations of transnational corporations-which changed the underlying trend of investment flows. Policy-related developments included the liberalization of trade and investment regimes, especially in the developing countries; the spread of privatization allowing transnational corporations to enter previously closed industries; changes in the exchange rate between the dollar and the yen, encouraging a wave of Japanese foreign direct investment; and regional integration schemes, notably the European Community, that induced considerable intra- and interregional investments. Structural factors-the size of international production and its increasingly integrated nature–also influenced the underlying trend. These long-term factors suggest that the scope for rapid growth of foreign-direct-investment flows remains substantial, over and above the stimulus to those flows from a recovery in the world economy. Imbalances across countries and regions–for example, the low level of investment flows to Japan-also indicate that there is plenty of room for further growth. The World Investment Report 1993 therefore projects that investment flows will grow along an upward trend, although cyclical factors will continue to result in short-term fluctuations during the 1990s. Such projections do not fully reflect the role of transnational corporations in influencing world development. 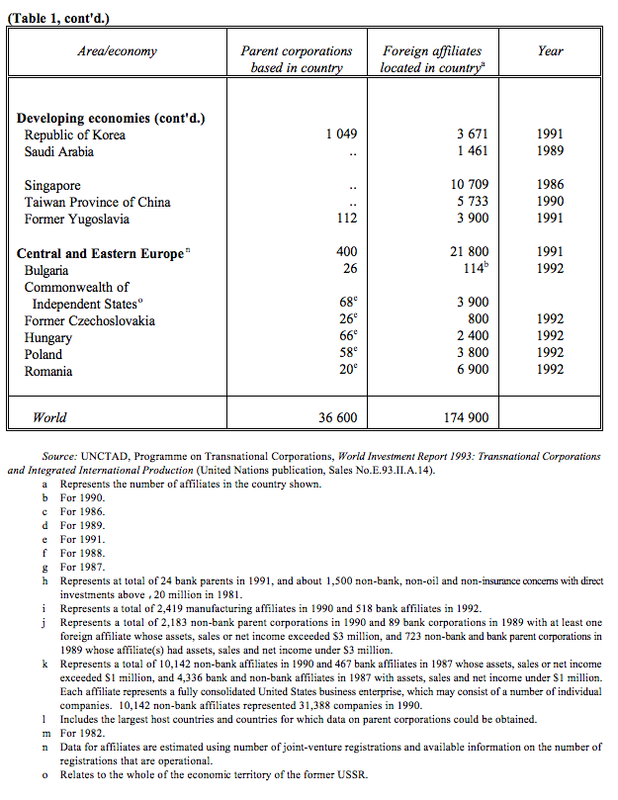 As discussed in last year’s report, World Investment Report 1992: Transnational Corporations as Engines of Growth (United Nations publication, Sales No. E.92.II.A.19), transnational corporations have an impact because they embody a package of potentially growth-enhancing attributes, including capital, technology, managerial and organizational know-how and access to international markets. These are becoming increasingly potent features of the growing integration of the world economy. The continuing growth of foreign direct investment is being facilitated by developments in the policy framework. At the multilateral level, examples include the adoption of the World Bank Guidelines on the Treatment of Foreign Direct Investment. They propose general standards of fair and equitable treatment, national treatment and most-favoured-nation treatment. Those standards apply, in principle, to all activities of foreign investors, from setting up abroad to the ultimate disposal of an investment. Elsewhere, the United Nations Conference on Environment and Development (UNCED), held in Rio de Janeiro in June 1992, adopted the Agenda for the 21st Century. It considers generic management issues and recommends that corporations establish world-wide corporate policies on sustainable development. These include policies to facilitate the transfer of clean technology to developing countries, to go beyond the existing practices and adopt no less stringent standards of operation as in their home country, and to report annually on their environmental records. These developments at the multilateral level, combined with an initiative of the OECD to examine the feasibility of a “wider” investment instrument, suggest that the search for a more comprehensive approach to foreign direct investment and the activities of transnational corporations continues. At the bilateral and national levels, too, policy developments continued in 1992. 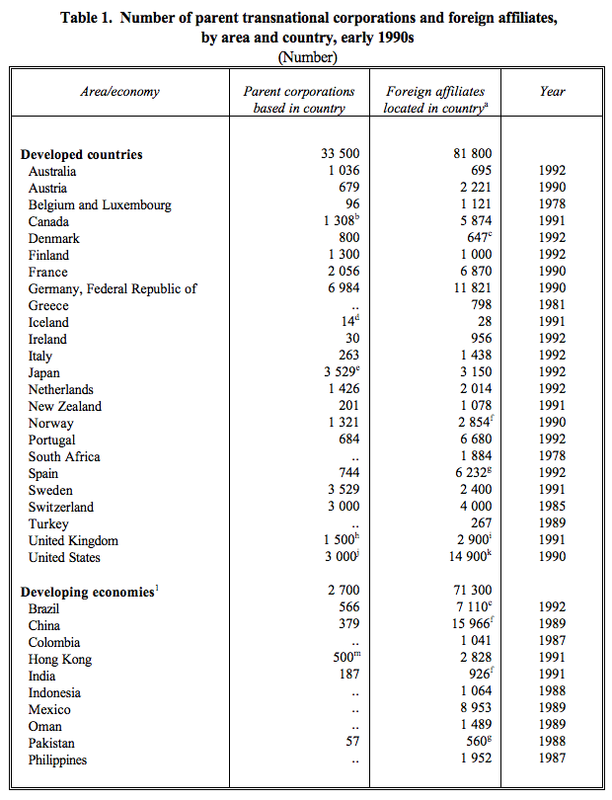 The number of bilateral investment treaties concluded by OECD countries reached 506 at the end of 1992, with a marked growth in the participation of Latin American countries and the newly independent states in Central and Eastern Europe. Nationally, all 79 new legislative measures adopted in 1992 in 43 countries were intended to liberalize the rules on foreign direct investment; in 1991, 80 of 82 measures were more liberal (as reported in the World Investment Report 1992). Other significant policy changes included legislative actions to increase intellectual property protection and to provide the legal conditions for the participation of transnational corporations in the privatization of state industries, a major source of foreign-direct-investment growth. The ability of transnational corporations to contribute to international economic integration is a result both of their attributes and of how they respond to the economic and policy environment in which they operate. The strategies of transnational corporations evolve, as firms respond to various pressures and opportunities, including improvements in information technologies, the convergence of demand patterns across countries, the intensification of competition and the opening of markets to international trade and foreign direct investment. The new strategies imply significant changes in how production is organized across borders; they have led firms to locate a wider range of their value-adding activities abroad. The strategies of transnational corporations increasingly involve more complex forms of crossborder integration (table 6). Under the simplest strategies–stand-alone affiliates or multi-domestic affiliates engaged in international production while serving a single host economy or host region–affiliates have a high degree of autonomy from the parent firm. They are responsible for most of the activities that comprise their value chain, and in some instances can act as self-contained entities. As trade barriers fall, as communications technologies improve and as international competition intensifies, firms are turning to outsourcing for parts of their value-adding operations. They are strengthening the links with their foreign affiliates and with separate firms operating as subcontractors, licences etc. However, these links are only for specific activities. The existence of outsourcing is based largely upon the cost advantages of a particular host country for a particular component. The affiliate or subcontractor engaged in outsourcing cannot stand alone. It depends upon the parent firm for a number of key activities, while the parent firm depends on the affiliate for part of its overall value chain. More recently, many transnational corporations have moved beyond these “simple integration” strategies. They are now treating all activities across the entire value chain as potential candidates for being performed by one or more affiliates. This new approach–“complex integration”–is made possible by huge improvements in communication and information technologies. They allow transnational corporations to coordinate a growing number of activities in a widening array of locations. This, in turn, changes the way in which transnational corporations structure their activities. In a number of instances, indeed, information technology is leading to a “re-engineering” of relationships within firms. Complex integration is also being driven by the tendency for markets to converge. More products are sold in the same or similar form in a growing number of national markets. In addition, competition forces firms to seek cost savings and profits from all segments of their value chains. As a result, companies are arranging certain functions-research and development, procurement, accounting, data entry and processing, as well as activities for specific products or product lines, such as component manufacturing and assembly–in a way that requires close links between parent firms and foreign affiliates, among foreign affiliates themselves and between parents and affiliates and firms linked via alliances. With that type of integration, separate activities performed in international locations are valued according to how they contribute to the objectives of the firm as a whole, rather than their profitability at the host country location. Integration is also occurring across geographical lines. Multidomestic strategies are being superseded by regional and global strategies. The institution or strengthening of regional integration agreements has helped foster regional strategies of transnational corporations, an issue analyzed in World Investment Report 1992. Some transnational corporations are beginning to pursue global strategies that include several major regions and cover the allocation of many elements in their value chains. Thus, activities such as research and development or procurement may be situated in an affiliate in a host country or region and linked to operations elsewhere to produce goods and services that are then sold in many markets. Integration is proceeding at different rates across industries and functions. The cross-national division of labour has undoubtedly proceeded most rapidly in certain manufacturing industries, such as automobiles and electronics, and in services industries including air transport and banking. Research and development, spurred by advances in information technologies, is becoming increasingly cross-border, both within firms and between firms through strategic alliances. But a truly global research-and-development and manufacturing system is still restricted to a relatively small number of firms. Financial management is probably the most global of the major corporate functions, stimulated by electronic transfers and the 24-hour trading day. Marketing has taken advantage of communications technologies, but is still subject to national, regional and cultural differences in consumer tastes and habits. Such activities as data processing and software-writing can take place almost anywhere in the world. On the other hand, regulatory differences mean that accounting and legal reporting are still largely nationally based. In principle, however, virtually every corporate function can be located anywhere and carried out in an integrated manner for a corporate system as a whole. To the extent that this is the most cost-effective way of organizing production–as it seems to be–it becomes a benchmark for firms that have not yet seized this opportunity or have not yet been driven by competitive pressures to re-engineer themselves. The strategies adopted by transnational corporations go together with changes in organizational structures. In particular, complex strategies have led to more complex mechanisms for organizing international production. Within firms, the decentralization of functional activities has led to a greater use of regional headquarters to manage regional activities, product headquarters located in host economies to manage the regional or global organization of particular products and functional headquarters in host economies to manage firm wide activities for a specific function. The dispersion of activities along the value chain leads to a dispersion of responsibility for those functions. In addition, the growth of strategic alliances has led to cross-firm linkages geared to specific activities frequently limited to well-defined periods of time. Strategic alliances usually involve shared functional responsibility and can blur the boundaries of the firm. The multiplicity of intra- and interfirm linkages, combining horizontal and vertical lines of authority and resource flows between units and across countries, can best be described in terms of networks. The growth of such networks is a major source of the deepening of economic linkages between countries. Although the nature of integration by transnational corporations has tended to become more complex, many firms continue to maintain older and simpler ways of organizing their international production. This is partly because the conditions leading towards complex integration are still evolving, and also because many of the simpler organizational forms remain useful. In addition, many firms will be unable or unwilling to adapt to changing conditions, but will continue to survive for some time. Complex strategies, pursued with greater functional integration both within and across firms and over a wide geographical area, combined with network structures of organizing activities, describe integrated international production at the level of the firm. The aggregation of the activities of those transnational corporations that are involved in such production creates a system of integrated international production at the level of countries. For Japan and the United States, between a quarter and a third of private-sector productive assets are potentially under the common governance of transnational corporations pursuing integrated international production. For the world as a whole, this percentage may be one-third. Integration can occur at different levels. The reduction in tariff barriers throughout most of the past 45 years and the recent spread of regional integration agreements have stimulated the exchange of goods and services among countries. This “shallow” form of integration opens many areas of an economy to the influence of international economic developments. The conditions that stimulate shallow integration also encourage transnational corporations to establish cross-border production systems that lead to “deep” integration, which is integration at the level of the production of goods and services as a result of complex corporate strategies and network structures (figure 2). Economic integration evolves through distinct stages. 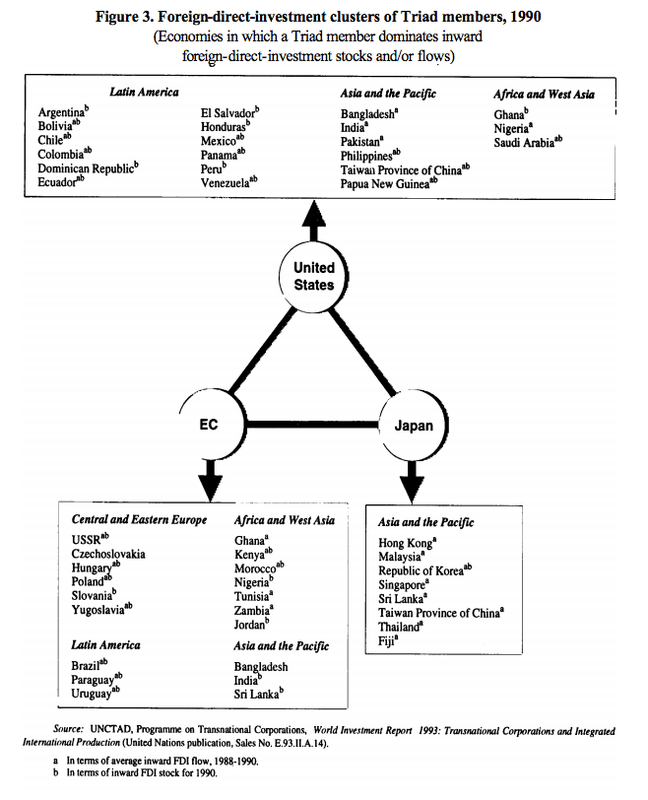 Links between countries move from (a) a relatively shallow type, to (b) somewhat deeper but still limited integration through international production by transnational corporations pursuing multi-domestic or simple integration strategies, to (c) links that are deeper, richer and qualitatively more complex. These last links are the features of integrated international production. The power of transnational corporations in stimulating integration stems from their role as central organizers of a broad range of economic activities, and the focus of their organizing efforts is increasingly towards (c). They are helped in this by the liberalization in many host countries of regulations on foreign control of assets. In addition, the proliferation of regional integration agreements-most prominently the Single Market within the European Community-stimulates deep integration, as they increasingly contain provisions liberalizing both trade and foreign direct investment. Thus, these agreements, described frequently as free-trade agreement, are also “free-production agreements” among national economies. As a result, the division of labour across countries increases, and trade and technology flows, especially intra-firm but also interfirm, expand. WILL A GLOBAL SYSTEM EMERGE? Just how many countries will be affected by this new system remains unclear. Foreign direct investment has tended to be concentrated among the industrialized economies, particularly the Triad, with a clustering of developing countries and economies in transition around each Triad member (figure 3). To some extent, this is because foreign direct investment follows trade, which is itself regionally concentrated. However, trade is more concentrated than foreign direct investment within regions. This suggests that trade may have played a prominent role in intraregional integration, whereas foreign direct investment has a greater capacity for promoting global integration. The emergence of integrated international production, which is likely to be more widely dispersed, should further strengthen the potential of foreign direct investment as a force for global integration. If that happens, trade may also begin to show more cross-regional patterns, given the linkages between foreign direct investment and trade. The extend to which individual countries become part of, and benefit from, the emerging integrated international production system depends upon the interaction of their location-specific advantages with the changing firm-specific advantages that transnational corporations enjoy in the context of integrating their functional activities on a regional or global basis. The emergence of complex integration strategies and structures implies changes in the nature of the ownership, internalization and locational advantages of transnational corporations. In particular, ownership advantages are becoming system-wide in nature and are exploited through either intra-firm or interfirm mechanisms. The result is a broader range of opportunities for host countries to attract TNC activities, but also higher requirements in terms of human resources and infrastructure, as well as open frameworks for trade and investment. Given the differentiation that prevails as regards attributes of developing host countries, the types of investments they can attract are likely to differ; it should also be recognized that the emerging international production system may leave many developing countries largely untouched for the time being. For those countries that do become part of the system, participation in the international division of labour is increasingly determined and coordinated by transnational corporations and their affiliates. The possibility to attract specific corporate functions may allow a host country to realize its own comparative advantages better. However, to reap the full benefits, developing countries must build up their indigenous human resources through education and training and their physical and technical infrastructure through investment. All these changes raise a wide range of policy issues, including corporate nationality, parent-affiliate relations and responsibilities, the international allocation of the taxable income of transnational corporations and policy options for host countries to maximize the benefits from integrated production. As regards the first three of these issues in particular, the more sophisticated forms of division of labour between foreign affiliates and their parent firms and among foreign affiliates located in a number of countries, a certain decline of economic autonomy of the constituent parts of integrated TNC systems and a certain dispersion of authority throughout those systems are beginning to strain some traditional concepts and approaches. The established approach in national and international law attributes nationality to corporations in accordance with certain criteria. This is done to ascertain what laws are applicable to corporations or to determine the Government that may exercise diplomatic protection on their behalf. Under conditions of integrated international production, this approach is becoming more difficult to apply and also less meaningful. Increasingly elaborate interpretations are needed to keep legal and policy prescriptions in touch with business realities. The growing use of the national treatment standard and of the broad provisions of investment-protection treaties may, in the long run, decrease the practical value of corporate nationality as a legal concept. Yet, informal understandings to clarify the issues and outline principles and procedures for avoiding or resolving conflicts could help to deal with emerging problems. A second area where integrated international production affects the status and operations of transnational corporations concerns the relations between parent firms and their foreign affiliates. The traditional legal view is that each affiliate within a larger corporate group is a separate entity with its own rights and responsibilities. In reality, however, the concept of separate corporate personality does not accurately reflect the functional ties between affiliates as a business group, and can hinder the attribution of responsibility among them. In the case of a TNC, the fact that individual affiliates have their assets and operations in several countries poses further jurisdictional and procedural problems that do not confront a domestic company. Integrated international production compounds those problems.As foreign affiliates become integrated parts of regional and global corporate systems, they may lose autonomy over both managerial and operational aspects. In such an environment, the concept of “parental responsibility” may need to be re-evaluated. Integrated international production can produce a network structure in which the concept of the parent firm itself takes on a different, more limited meaning. The parent may become more of a coordinating agent for certain corporate activities, which have been dispersed to regional, product-line or functional headquarters or to individual affiliates. The right thing to do may therefore be to focus on relations and responsibilities among all members within a corporate group, rather than on the parent firm or affiliate responsibility; perhaps the concept of “group responsibility” deserves further exploration.The increasingly complex nature of corporate activities has already resulted in the adoption of group concepts in various areas of law. The practice differs from jurisdiction to jurisdiction, depending on the specific concerns to be tackled. This risks increasing the number of conflicting requirements being imposed on transnational corporations by States. It would be useful if those countries already experimenting with specific aspects of group concepts were to cooperate whenever some legal uniformity is possible. Public opinion seems to be relevant to the issue of corporate responsibility. In the public’s perception, the business of a parent company and that of its affiliates are typically one and the same. Also, transnational corporations do recognize that their reputations rest on the behaviour of affiliates as well as parents.Although parent companies have refused to accept legal responsibility for the actions of their affiliates, they have nevertheless been actively involved in out-of-court settlements of law suits brought against their affiliates, especially when environmental catastrophes are involved. Thus, while the law still wrestles with how to allocate responsibility between the TNC parent and its affiliates, solutions may be shaped by public opinion. The deepening of TNC linkages also raises questions about where groups of associated enterprises earn taxable income, how it is distributed and how the revenue from taxing their income is ultimately allocated among countries. The prevailing conventional approach to the allocation of business income for tax purposes has been to treat the parent firm and its foreign affiliates as separate and independent enterprises, and to apply the arm’s-length standard for determining the allocation of taxable income from transactions involving related or unrelated parties. Given the widespread use of various intra-firm arrangement under conditions that differ from those prevailing between independent parties, a number of tests have been developed over the years aimed at determining whether related-party transactions conform with arm’s length standards for tax purposes.However, with the growing complexity of the intra-firm division of labour, it is harder to identify separate costs and earnings for individual transactions and to compare them with unrelated-party transactions. Those difficulties have led authorities to explore other approaches and methods for allocating income. Overall, the general norm appears to be to use the separate enterprise approach when comparable prices exist, and to use an apportionment approach that takes the TNC system as a whole when they do not exist. Finding satisfactory solutions matters as much to Governments as to transnational corporations. Governments need to prevent an erosion of their revenue base while, at the same time, providing a climate that attracts and retains foreign direct investment. Apart from these legal and policy issues, integrated international production has also implications for the national policy framework concerning transnational corporations. The rapid growth of foreign direct investment during the 1980s has made Governments more aware of the benefits that such investment can bring to an economy in terms of capital, technology, management and access to established distribution networks. In the resulting competition to attract transnational corporations, foreign-direct-investment regimes in many countries have become broadly similar. In particular, differences regarding right of establishment, fair and equitable treatment, national treatment, nationalization, compensation, dispute settlement and the repatriation of earnings become less effective as a means to capture foreign direct investment. Instead, the nature of the overall policy framework and the economic conditions of production become the key to locational decisions. There is general agreement that efficient economic institutions and a stable macroeconomic climate are preconditions for attracting foreign direct investment. Beyond that, Governments must provide efficient infrastructure and facilitate international trade exports to allow firms to bind into the international production system. However, since integrated international production involves more sophisticated corporate strategies and structures, government policies need to become more sophisticated too. In particular, since every part of the value chain can potentially be located anywhere in the world, Governments need to focus their promotional strategies on attracting those functions in which their countries have a comparative advantage. Furthermore, Governments could give more attention to reducing transactions costs for potential investors, providing post-approval support services and attracting specific transnational corporations of particular value to the national economy. The World Investment Report 1992 suggested that policy discussions–nationally, regionally and multilaterally–might benefit from greater attention to foreign-direct-investment issues. As host countries, especially developing countries, seek to boost their competitive position in a world economy that is becoming integrated at the production level, their ability to dovetail their domestic economies to the strategies and structures of transnational corporations becomes increasingly critical. At the international level, the need to avoid “policy competition” among host countries, as each seeks to attract transnational corporations, expands the range of policy issues on the international agenda and may lead to a greater concern for policy harmonization.